Welcome Pi Day! This year I took the easy route…well not the easiest route but a fairly easy route and made chicken pot pie. Instead of painstakingly making pie crust or puff pastry and making a chicken mixture from scratch I took some shortcuts. One of the things I should mention is that I cooked the puff pastry separately from the chicken mixture. I know it’s not traditional but I really like the flaky and crispy crust. Bake the puff pastry according to the directions and set aside. In a separate pan over medium heat, melt the butter and add the onions. Once the onions become translucent, add the condensed soup, milk, peas and carrots, and chicken. Cover and cook for 5 minutes. 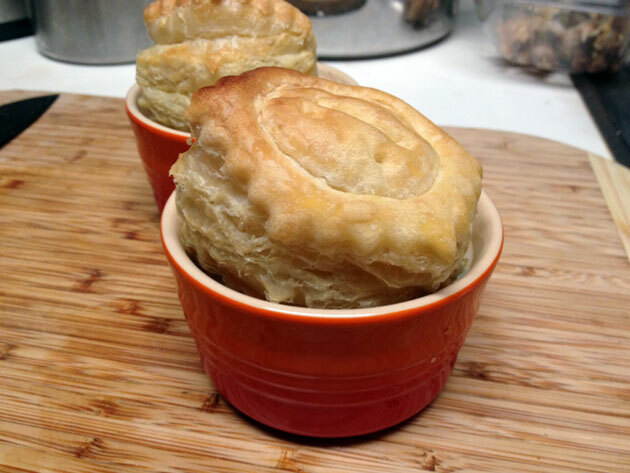 Scoop chicken mixture into ramekins and place cooked puff pastry on top. Serve. Try to time the puff pastry with the chicken mixture. I started the puff pastry and about 10 minutes in started the chicken mixture.